After an emotional pregame ceremony honoring those lost in the attacks and the rescue and recovery workers, the game, between the New York Mets and Atlanta Braves, was scoreless until the fourth inning. The Braves scored in the top of the frame, and the game was tied when Piazza scored on a sacrifice fly. The Braves took the lead, 2-1, in the top of the eighth inning. Piazza was called up to the Dodgers on September 1, 1992, and immediately placed in the lineup. He went 3-for-3 with a double and two singles before coming out for a pinch-runner.27 Piazza finished the season with a .232 average with one home run and 7 RBIs. 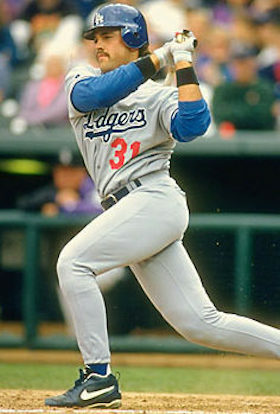 Piazza was named the everyday catcher for the Dodgers in 1993. He responded by winning the National League Rookie of the Year Award, finishing the season with a .318 average, 35 home runs, and 112 RBIs. His 35 home runs were the most ever by a rookie catcher28 and his RBIs were tied for the third highest by a National League rookie at the time. While his productivity continued after the 2000 season, Piazza was involved in a number of rumors and controversies during the 2002 and 2003 seasons. In early May 2002 he responded to the New York tabloids that questioned his sexual orientation. Piazza said he was heterosexual. He also said he felt players could accept an openly gay teammate.55 Later that month, Piazza told the New York Times that he had used androstenedione (legal at that time but since banned by baseball as a steroid), for a short time but discontinued its use “when he did not see a drastic change in his muscle mass.”56 In 2003 controversy once again swirled around Piazza as he learned from the media that the club planned to have him take some groundballs at first base in an attempt to move him to a less demanding position.57 While this angered Piazza, he said that “If [Art Howe, Mets manager,] asks me to go out there, I may not be that good, but I’ll go out and do what’s best for the team.”58 Piazza played a total of 69 games at first base for the Mets. On January 29, 2005, Piazza and Alicia Rickter were married at St. Jude Catholic Church in Miami.63 As of 2015 they had three children, Nicoletta Veronica (2007), Paulina Sophia (2009), and Marco Vincenzo (2013). On October 2, 2005, before a crows od 47,718, Piazza played his final game as a Met.64 After being replaced behind the plate late in the game, the man who “turned Shea into his playground”65 was greeted with a tribute from the team and the fans. A teammate, third baseman David Wright, said: “You have to be the man to have a major league baseball game stop for you for a five-minute tribute and then have five or six curtain calls.”66 In his 7½ seasons as a Met, Piazza batted .296 with 220 home runs and 655 RBIs.67 He caught the ceremonial last pitch from Tom Seaver at Shea Stadium on September 28, 2008, and the ceremonial first pitch from Seaver at CitiField on April 13, 2009. 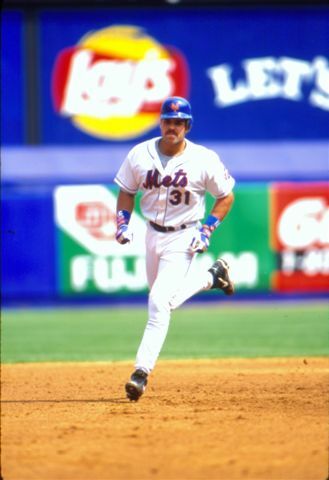 Piazza was inducted into the New York Mets Hall of Fame on September 29, 2013. Piazza returned to the West Coast for the 2006 season, signing a one-year, $1.25 million contract with the San Diego Padres.68 He had a solid year for the team, batting .283 with 22 home runs and 68 RBIs.69 For the 2007 season he signed a one-year, $8.5 million contract with the Oakland A’s. After a shoulder injury in early May led to an 11-week stay on the disabled list,70 Piazza returned and finished the season with a .275 average, 8 home runs, and 44 RBIs. Baer, Susan. “Major-League Romance.” InStyle, July 4, 2005: 270. Ballard, Chris. “Oakland Athletics,” Sports Illustrated, March 26, 2007: 97-98. Bamberger, Michael. “The Quiet Slugger Says Goodbye,” Sports Illustrated, June 2, 2008: 17. Bechtel, Mark, and Jeff Pearlman. “All Seems Forgiven,” Sports Illustrated, September 7, 1998: 72-76. Bodley, Hal. “Clemens Makes Best of Situation,” USA Today, July 14, 2004: 4C. Bodley, Hal. “Piazza Shows Flexibility as A’s DH,” USA Today, April 24, 2007: 5C. Buckley, Steve. “Piazza’s Hard Work Puts Catcher at Top,” Baseball Digest, November 1999: 32-33. Delgado, Joel. “Mike Piazza Makes His Ballet Debut in Miami, a Hit Man Again,” Newsday (Long Island, New York), May 4, 2013. newsday.com/sports/baseball/mike-piazza-makes-his-ballet-debut-in-miami-a-hit-man-again-1.5193958 Accessed July 22, 2015. Dicker, Ron. “Catchers Honor One of Their Own,” New York Times, June 19, 2004. nytimes.com/2004/06/19/sports/catchers-honor-one-of-their-own.html. Accessed July 22, 2015. Esposito, Andy. “Mike Piazza Mets Moments,” New York Mets Inside Pitch, September 2008: 16-17. Golenbock, Peter. Amazin’ (New York: St. Martin’s Press, 2002). Hermoso, Rafael. “Piazza Puts Big Hurt on Board,” New York Daily News, 2002. Hiestand, Michael. “Networks Find On-Air Postseason Talent Waiting in Dugouts,” USA Today, October 3, 2005: 15C. Kiner, Ralph, and Danny Peary. Baseball Forever (Chicago: Triumph Books, 2004). Lefton, Brad. “You Have to Hand It to Piazza for Keeping a Firm Hold on a Catching Job,” The Sporting News, June 16, 2006: 42. Libenthal, Larry. Double Blackjack (Lincoln, Nebraska: iUniverse, 2004). Lowry, Vicky, and Christine Rosa. “The Sexiest Men in Sports,” Sports Illustrated Women, July/August 2002: 72-101. Lupica, Mike. “From Star to City, Both Sides See the Light,” New York Daily News, 2002. Marini, Victoria, ed., “Piazza,” New York Daily News, 2002. “Me and My Bat,” Sports Illustrated, March 25, 2002: 80. Pond, Alex, and Kevin Ferris. “Kids Ask…,” Sports Illustrated for Kids, May 1994: 24-25. Reich-Hale, David. “Three Catchers, Two Positions,” New York Mets Inside Pitch, May 2004: 13. Roberts, Brendan. “3 Questions With Mets Catcher Mike Piazza,” The Sporting News, April 22, 2005: 70. Rose, Howie, and Phil Pepe. Put It in the Book: A Half-Century of Mets Mania (Chicago: Triumph Books, 2013). Ross, Alan. Mets Pride (Nashville: Cumberland House Publishing, Inc., 2007). Sheinin, Dave. “Baseball: Inside Dish.” The Sporting News, August 19, 2002: 14-16. Urban, Mychael. “Oakland Athletics,” The Sporting News, May 14, 2007: 42. Verducci, Tom, and David Sabino. “Catch This!” Sports Illustrated, August 21, 2000: 38-43. Verducci, Tom. “Near, Yet So Far,” Sports Illustrated, September 24, 2001: 36-37. Wright, Craig. “Piazza, Hall of Fame Catcher,” in Hardball Times Baseball Annual 2009 (Chicago: Acta Sports, 2008), 148-155. 1 Bruce Herman, New York Mets: Yesterday and Today (Lincolnwood, Illinois: Publications International, 2010), 123. 2 Michael Bamberger, “Like So Many Other New York City Firefighters Who Died on September 11, Mike Carroll Was a Dedicated Athlete and Local Teammate Whose Indomitable Spirit Led Him to Embrace His Final, Heroic Mission, His Young Son Would Find Comfort in the Company…,” Sports Illustrated, December 24, 2001: 106. 3 Mike Piazza and Barry Rozner, “The Game I’ll Never Forget,” Baseball Digest, November/December 2013: 39. 4 John Snyder, Mets Journal (Cincinnati: Clerisy Press, 2011), 275. 5 Herman, New York Mets: Yesterday and Today, 123. 6 Piazza and Rozner, “The Game I’ll Never Forget”: 41. 7 John Rolfe, “Catching the Beat,” Sports Illustrated Kids, June 1995: 35. 8 Veronica Loveday, Great Athletes of Our Time (Great Neck, New York: Great Neck Publishing, 2011), 12. 9 Michael Bamberger, “Playing the Dodger Blues,” Sports Illustrated, May 25, 1998: 34. 10 Rolfe, “Catching the Beat,, 32. 12 Kelly Whiteside, “A Piazza with Everything,” Sports Illustrated, July 5, 1993, 13. 14 David Ferry, Total Mets (Chicago: Triumph Books, 2012), 327. 15 Mike Piazza and Lonnie Wheeler, Long Shot (New York: Simon & Schuster, 2013), 19. 16 Rolfe, “Catching the Beat,” 34. 17 Whiteside, “A Piazza With Everything”: 14. 19 Steve Delsohn, True Blue: The Dramatic History of the Los Angeles Dodgers, Told by the Men Who Lived It (New York: HarperCollins Publishers, Inc., 2001), 238. 20 Duke Snider and Phil Pepe, Few and Chosen: Defining Dodgers’ Greatness Across the Eras (Chicago: Triumph Books, 2006), 11. 21 Andy Esposito, “Catching Greatness,” New York Mets Inside Pitch, August 2004: 9. 23 Whiteside, “A Piazza with Everything”: 16. 24 Peter C. Bjarkman, The New York Mets Encyclopedia (New York, NY: Sports Publishing, Inc., 2001), 85. 25 Tim Kurkjian, “Slim Pickings,” Sports Illustrated, March 15, 1993: 34. 26 Bjarkman, The New York Mets Encyclopedia, 85. 27 Piazza and Wheeler, Long Shot (New York: Simon & Schuster, 2013), 90. 28 Rolfe, “Catching the Beat”: 32. 29 Richard Hoffer, “Catch a Rising Star,” Sports Illustrated, May 13, 1996: 76. 30 Larry Granillo, “Wezen-Ball”, Baseball Prospectus, January 7, 2013, baseballprospectus.com/article.php?articleid=12834, accessed July 22, 2015. 31 “National League Wins All-Star Game,” Jet, July 29, 1996: 50. 32 Bamberger, “Playing the Dodger Blues”: 32. 33 Delsohn, True Blue: The Dramatic History of the Los Angeles Dodgers, Told by the Men Who Lived It, 253. 34 Delsohn, True Blue: The Dramatic History of the Los Angeles Dodgers, Told by the Men Who Lived It, 262. 35 Tom Verducci, “Fox in the Hunt,” Sports Illustrated, May 25, 1998: 44. 36 Bamberger, “Playing the Dodger Blues”: 41. 37 Mark Bechtel and Jeff Pearlman, “Diamondhacks,” Sports Illustrated, June 1, 1998: 87. 38 David Ferry, Total Mets, 317. 39 Michael Bamberger, Kevin Cook, and Richard O’Brien, “Golden Mike Award,” Sports Illustrated, November 2, 1998: 38. 40 Joe McDonald, “Mike Piazza Mets Moments,” New York Mets Inside Pitch, September 2008: 16. 41 Howie Karpin, 162-0: Imagine a Mets Perfect Season (Chicago: Triumph Books, 2011), 67. 43 Bechtel and Pearlman, “Diamondhacks”: 87. 44 Jaime C. Harris, “Piazza’s Big $$$$$ Contract Continues to Raise Questions on Race,” New York Amsterdam News, November 5, 1998: 53. 45 Rusty Staub and Phil Pepe, Few and Chosen: Defining Mets Greatness Across the Eras (Chicago: Triumph Books, 2009), 63. 46 Bamberger, Cook, and O’Brien, “Golden Mike Award”: 38. 47 Matthew Silverman, Best Mets (Lanham, Maryland: Taylor Trade Publishing, 2012), 179. 48 Bamberger, Cook, and O’Brien, “Golden Mike Award”: 38. 49 Karpin, 162-0: Imagine a Mets Perfect Season, 66. 50 Tom Verducci, “Going Batty”, Sports Illustrated, November 1, 2000: 102. 51 Verducci, “Going Batty”: 103. 52 Marlon McRae, “Mets, Yanks, Piazza and Clemens Slug It Out in Big Apple Brawl,” New York Amsterdam News, October 26, 2000: 56. 53 Verducci, “Going Batty”: 103. 54 Bjarkman, The New York Mets Encyclopedia, 21. 55 Don Cronin, “Piazza Denies Gay Rumors,” USA Today, May 22, 2002: 1C. 56 Rafael Hermoso and Tyler Kepner, “Steroid Use Becomes a Topic of Discussion in Clubhouses,” New York Times, May 30, 2002, nytimes.com/2002/05/30/sports/baseball-steroid-use-becomes-a-topic-of-discussion-in-clubhouses.html, accessed July 22, 2015. 57 Hal Bodley, “Mets’ Phillips Gets Away from It All,” USA Today, May 13, 2003: 4C. 58 Albert Chen, “First Move,” Sports Illustrated, August 25, 2003: 80. 59 Mark Beech, Richard O’Brien, and Richard Deitsch, “Piazza’s European Vacation,” Sports Illustrated, December 2, 2002: 26. 60 Piazza and Wheeler, Long Shot (New York: Simon & Schuster, 2013), 273. 61 Jon Saraceno, “Baseball Hasn’t Been Easy for Italians to Swallow,” USA Today, March 10, 2006: 6C. 62 Snyder, Mets Journal, 289. 63 Susan Baer, “Major-League Romance,” InStyle, July 4, 2005: 270. 64 McDonald, “Mike Piazza Mets Moments”: 17. 65 Silverman, Best Mets, 29. 66 Alan Ross, Mets Pride (Nashville, Tennessee: Cumberland House Publishing Inc., 2007), 119. 67 Karpin, 162-0: Imagine a Mets Perfect Season, 85. 68 Albert Chen, “SoCal, So Cool,” Sports Illustrated, August 14, 2006: 77. 69 Piazza and Wheeler, Long Shot, 325. 70 Mel Antonen, “Piazza’s Strong Return Might Boost Trade Value,” USA Today, September 26, 2007: 2C. 71 Piazza and Wheeler, Long Shot, 335-336. 72 Wright, “Piazza, Hall of Fame Catcher”: 155. 73 Dan Fox, “Schrodinger’s Bat”, Baseball Prospectus, July 6, 2006, baseballprospectus.com/article.php?articleid=4945, accessed July 22, 2015; Zachary D. Rymer, “What Is Holding Voters Back from Sending Mike Piazza to Hall of Fame?”, MLB Team Stream, January 6, 2015, bleacherreport.com/articles/2320920-what-is-holding-voters-back-from-sending-mike-piazza-to-hall-of-fame, accessed July 22, 2015. 74 Max Marchi, “The Stats Go Marching In,” Baseball Prospectus, May 16, 2013, baseballprospectus.com/article.php?articleid=20928, accessed July 22, 2015. 75 Wright, “Piazza, Hall of Fame Catcher”: 153. 76 Lyle Spencer, “Catcher Mike Piazza Ends an Impressive Career,” Baseball Digest, August 2008: 78. 77 Chuck Hildebrandt and Mike Lynch, “The Retroactive All Star Game Project,” Baseball Research Journal (Phoenix: Society for American Baseball Research, Spring 2015): 11. 78 Bill Francis, “Griffey, Piazza honored by Hall election”, January 6, 2016, http://baseballhall.org/news/griffey-and-piazza-honored-by-hall-of-fame-election, accessed January 10, 2016. 79 Staub and Pepe, Few and Chosen: Defining Mets Greatness Across the Eras, 6. 80 Bill Francis, “Class of 2016 Reflects on Election”, January 7, 2016, accessed January 10, 2016.